One of the greatest summertime pleasures is going to cottage to have fun with friends. How to make it better? Apparently with a drink in hand. I took a bottle of undiluted premium sake to cottage this weekend. It was a 300ml bottle of Jizake Tenzan that I bought at LCBO a few days ago. Packaging of the sake was very unique that the bottle was wrapped with two dried bamboo leaves and tied with hemp rope. It certainly caught my eyes at LCBO, and I am sure it did with other consumers as the brewery claimed that “it’s very popular with Tenzan fans all over the world”. This sake was classified as Tokubetsu Junmai Genshu. Since it was undiluted in the brewing process, the alcohol content was a little higher than other types of sake at 18.5%. The brewer used local rice to brew the sake. Varieties include Sagano, Hana and Reihou. Rice was polished to 60%. Sake’s SMV was +2, and its acidity level was 2. I, therefore, expected to drink a dry sake with rich, earthy and full bodied flavours. It might have a mellow aroma as well. Jizake Tenzan was brewed in Saga Prefecture by Tenzan Sake Brewery. Mother nature blessed Saga Prefecture, as one of the main sake producing regions in Japan, is well known for growing high quality rice and having clean water sources. Those are two essential elements for producing good quality sake. There are more than 20 breweries in Saga Prefecture. Tenzan Sake Brewery, established in 1875, is one of the oldest breweries in the region. The earth tone packaging of Jizake Tenzan indeed matched well with the nature. 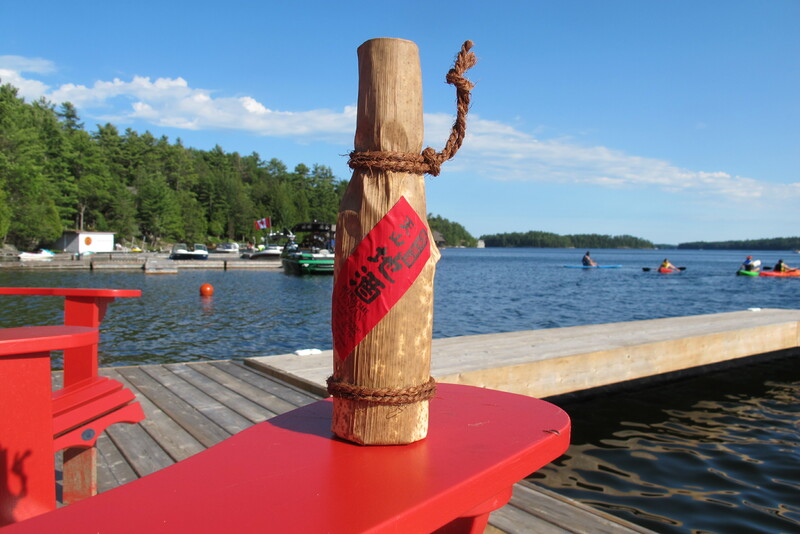 Drinking sake at the cottage is my way to romanticize the summer retreat in Canada. A tasting notes for Jizake Tenzan will be posted soon.